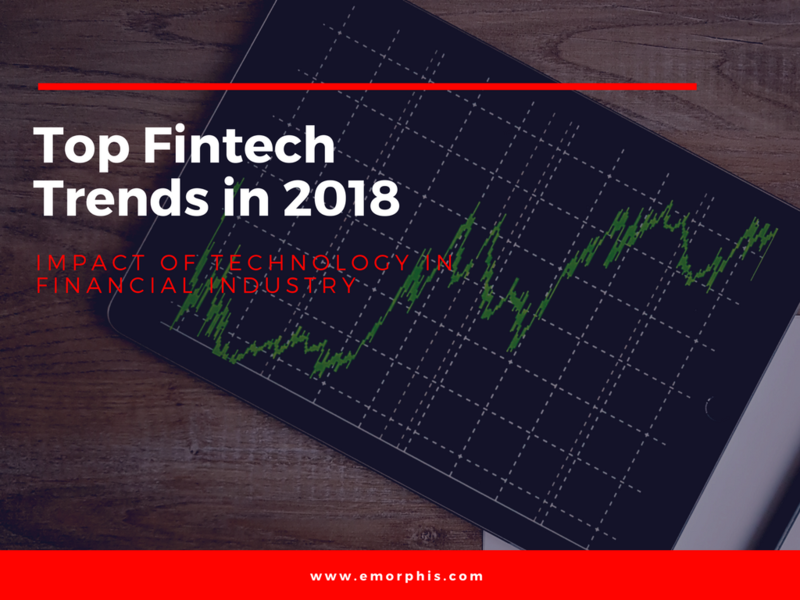 Fintech trends in 2018 clearly indicate that technology is going to play a key role in all financial entities. Until 5 years back technology was only being considered as a tool for better management of database and easy financial transaction; for most us, financial technology was a synonym of online banking transactions only. But now time is changing fast for the financial industry and it will not be wrong to say that technology is part of financial industry’s DNA. The conducive environment is allowing start-ups to do innovation in fintech application development; today more entrepreneurs are coming up with their fintech startup and in fact, technology is playing a key role in winning the trust of investors. With powerful smartphones, better technology players and support of investors, fintech industry is progressing and changing very swiftly. Trusting the current fintech trends, we can easily say that leveraging the technology evolution, financial industry landscape has been going through one of the most profound and positive transformations. There have been a number of fintech trends disrupting financial services, reinventing the process that makes a comfortable user engagement; be it peer to peer lending, funding platforms or mobile payments. These changes are so impactful that there is a significant growth in the way financial services work. Fintech trends in 2018: Top technologies that will be playing a key role. Blockchain Technology in Fintech- Talking about the innovation and upcoming fintech trends, Blockchain tops the list. Considered as one of the most transparent and secured systems to transact and trade, Blockchain is reshaping the Fintech ecosystem with speed, transparency, faster payments, security, and compliance. This distributed ledger technology assist in distributing, storing and tracking currencies and heading towards creating a revolution in payments segment. Making digital identification easy for the customers and banks connected to a blockchain. Traditionally, for customers who want to have accounts in multiple banks are required to furnish personal details to every bank. This makes the process troublesome and time-consuming for both the entities. Using blockchain will help in storing consumer information once and sharing with the banks connected to the shared ledger. This will help in reducing costs along with maintaining security. Facilitate seamless cross-border payments. Usually, these payments involve intermediaries such as banks and remittance centers to process cross-border transactions. Blockchain technology eliminates the need for mediators and allows simplified payment transaction. Maintains an audit trail for all the trading and transactions carried out on the system that helps in detecting any illegal transaction from source to destination. Smart Contracts are another benefit of using Blockchain technology. These are self-executing contractual instructions that eliminate the need for third-party lawyers, judicial system or agreement papers between the trading parties. Smart Contracts make the contracting process efficient and quick. Artificial Intelligence & Machine Learning in Fintech- With Artificial Intelligence expanding its wings across all industries, financial establishments are no left behind. The financial institutes realize the need for efficient customer services and thus have started working on the hold-ups in the customer journey. The use of AI in the trading process helps in optimization of the process by identification of elements that hamper and slow down the flow of financial route. Implementation of AI across all the establishments would automate the most important back office processes by enabling data analysis and communication across all connected systems within an organization. Some of the best examples of AI & Machine Learning technologies already implemented include voice services for customer interaction, fraud detection algorithms etc. Another complex combination of the AI and machine learning interface were the natural language processing applications referred to as chatbots, extensively used in personal finance web or mobile applications. Implementing chatbots is considered as one of the most productive investments of financial institutions. These secured apps connect with your bank account and provide immediate insights on your existing finances and advice on smart savings, budgeting and future considerations too. You may also like reading: How Machine learning & Artificial Intelligence helping Industrial Automation. Cloud Computing & Advanced Data Analytics – Consumers today are more selective and look out for information that is of their interest and specific to their needs. This is where the data analytics and cloud computing benefit the financial establishments. Utilizing these technologies will allow banking organizations to fetch data about consumer profile & interest and provide a custom product, service or experience to the consumers based on their requirements. With the increasing competition in the financial services industry, the institutes providing more secure, efficient and tailor-made solutions to customers would lead. By enabling cloud-based backend infrastructure, the companies can fetch more refined data, can cope with the consumer demands better and optimize working efficiency. Social Trading and Financial Wellness Platforms – Does this come to you as a surprise? Thoughts on financial services involve security, trust, and use of confidential information and if it collaborates with the social media, it looks like a concern. Well, with the increasing number of social media users and consumers looking for relevant information over the social media platforms it is definitely a good idea for the financial institutes to walk on social trading. Here it does not mean carrying on transaction over the social platforms but does more towards getting benefitted by the knowledge of other people and gaining insights on financial understand. As social media has intensely reached consumer lives, financial establishments provide a social trading or financial wellness platform for consumers to share their thoughts, concerns, and queries allowing them to make potentially correct financial decisions. Getting more of mobile technology – One of the best examples to understand the mobile technology in the finance sector is the way payments are made these days. With the Fintech industry becoming more consumers focussed, it has started being carried by the mobile technology. As more and more consumers prefer to operate and trade via mobile phones, the introduction of new Fintech mobile app development would continue to raise allowing ease and comfort to the consumers. Peer-to-peer Lending – Another hottest trend in Fintech is the P2P lending. This is gaining momentum and is successful as the P2P firms offer investors/ lenders with the better returns on interest rates in comparison to the banks. This is one of the finance processes which are more of a challenge to retail banks. Making loan applications extremely time-saving, no pre-payment penalties, quick approval time and low-interest rates, peer-to-peer lending platforms is the niche and evolving trends not limited to sharing money. The new technological innovations such as blockchain, AI, Internet of things and big data will work as a new source of energy for the financial industry that powers the need to get smarter and create a better-connected ecosystem that exceeds and meet financial goals of consumers. What is IIOT – All About Industrial Internet of Things. →← Industrial Automation 2.0: How Machine learning & AI are changing the game.